Landscape lighting has become a popular way to landscape your yard at night. New Outlook Landscaping is the best team in the Harrisburg PA area to handle your landscape lighting project. 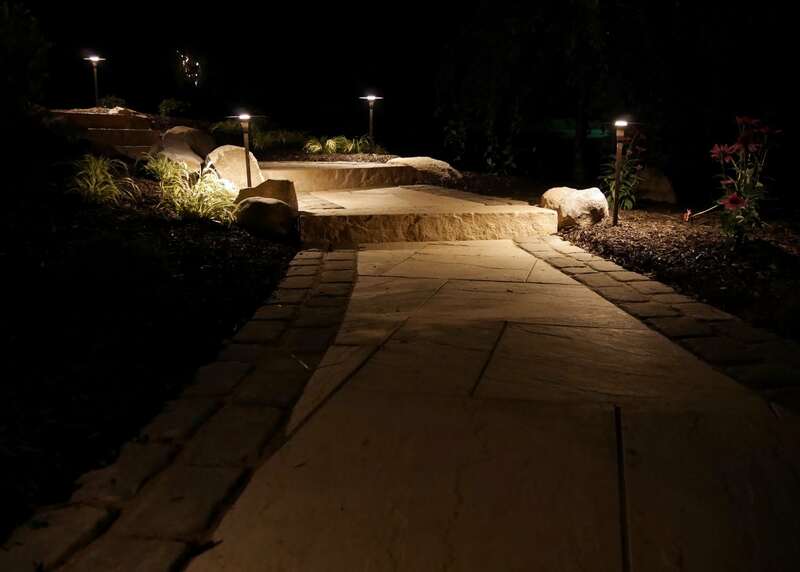 We use a combination of pathway lights, spot lights, and accent lights to provide both a safe and well lit property as well as a beautiful view of your house and landscape when its dark out. We use low voltage LED and incandescent lights which can run off of less than 4 watts of power each. These lights are much brighter and longer lasting than the solar lights sold at the department stores. We can also install a timer that will turn the lights on and off at specified times so that you don’t have to touch a thing.